This month Beautybox from Look Fantastic has the theme ”Ready Set Glam” and packaging is always so stunning! Don’t be boring give more glam to your life??! 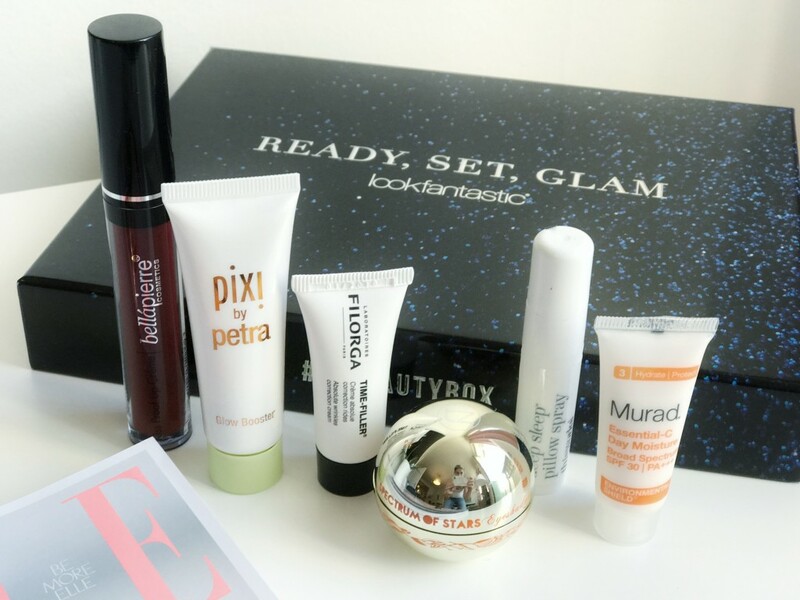 This month’s #LFBEAUTYBOX is filled with glamour products to give you a shine of the stars! ✨Kiss Proof Lip Crème from Bellápierre, the color I got was 40s red, it’s just the perfect dark cold red for a party with a 40-ties feeling. Bellapierre Kiss Proof Lip Crèmes are full coverage, high impact liquid lipsticks that last for hours without the need to touchup. Their creamy formula goes on smoothly and dries to a beautiful matte finish in a snap! . ✨ Glow booster in color White Pearl from Pixi. It’s a liquid face illuminator and perfect to give your skin that glow from inside. It has a Lightweight and silk-textured, the liquid primer enhances your natural radiance and perfectly preps skin for further makeup. Working to smooth and blur the look of imperfections, the fluid highlighter contains brightening Mica as well as iridescent pigments to impart a dewy, radiant finish. ✨Essential-C Day moisturiser with spf 30, from Murad. It was a long time since tried and worked with Murad products so looking forward to try this.This is a powerful, antioxidant-rich daily moisturizer that shields and revitalizes environmentally stressed skin. It’s made to protect your skin from UVA/UVB rays and free-radical damage, while improving skin’s radiance, firmness, and elasticity. ✨Spectrum of the stars eyeshadows, from Teeez Cosmetics. So beautiful packaging of this eyeshadow, I just adore the little golden ball:-). I got the green color Forest Luster. Including Argan Oil with anti-aging properties to moisturize your skin for a smooth texture. Don’t miss this bit of velvety bliss for outrageous on-trend eyes. ABSOLUTE WRINKLE CORRECTION CREAM. ALL FILORGA’S NON SURGICAL ANTI-AGEING EXPERTISE IN A CREAM THAT CORRECTS ALL WRINKLES. ✨Deep sleep pillow spray from this Works. This has a little stronger scent for my taste but maybe it works. I love aromatheraphy. A superblend of Lavender, Camomille and Vetivert that is clinically proven to increase sleep quality so you wake up looking and feeling refreshed, with skin that’s ready for the day.